Simply called Skalka in Polish, this sacral complex located on a small outcrop in Kazimierz district, comprises of a church and Pauline monastery. 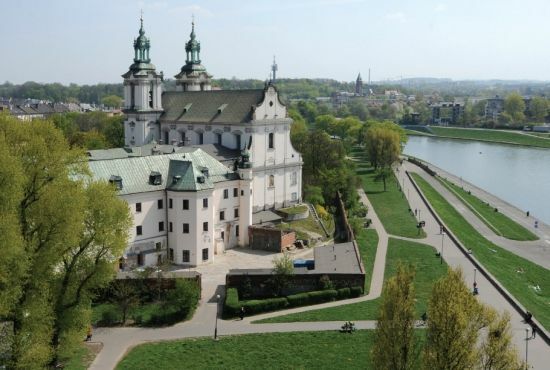 It was founded as the major shrine of St. Stanislaw, one of the main saint patrons of Poland. In 1079 Stanislaw, then bishop of Krakow, was murdered by order of Polish king Boleslaw II the Bold, as he criticised and opposed the king. Skalka is said to be the exact spot of the horrific slain. As a result, the king was sent into exile and Stanislaw canonised. 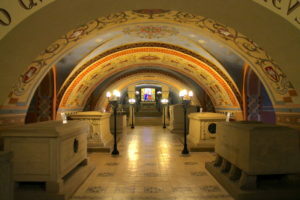 Underneath the church there is also a crypt that serves as a “national Pantheon”, where the great Poles are buried. Pauline Church on the Rock is primarily associated with the martyrdom of St. Slanislaw. Although it is not certain whether the bishop was murdered by the king himself or on his orders, Skalka has drawn attention of pilgrims for centuries now. Stanislaw was murdered by quartering and his cult began with the miraculous growing back together of his limbs during the night. Ten years after Stanislaw’s death, his relic was moved to Wawel Cathedral, but Skalka has been the major shrine ever since. In 1253 bishop Stanislaw was canonised and became one of main Polish patrons. He became a pivotal figure in shaping the Polish political culture and monarchy. 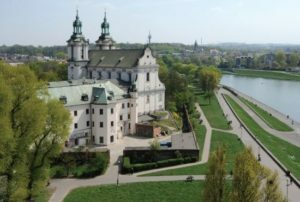 Each newly elected king of Poland would make a pilgrimage to Skalka on the eve of their coronation as a penance for the disgraceful actions of their predecessor responsible for St. Stanislaw’s death. Today’s church is probably the third temple that stands here. The first one, a Romanesque rotunda was the witness of St. Stanislaw’s slain. In the 14th century, king Casimir III the Great, founded a Gothic church that was severely devastated during the 17th-century Swedish invasion. It was torn down to make room for the impressive Baroque complex that Skalka is today. The works began in the 1730’s and lasted until the end of 18th century. At the turn of the 19th and 20th centuries, Skalka church was renovated. The Pauline Order was invited to Skalka by chronicler bishop Jan Dlugosz in 1472. Skalka has served as Pauline monastery ever since. In 1880, on the 400th anniversary of Jan Dlugosz’s death, his relic was moved to Pauline Church on the Rock. 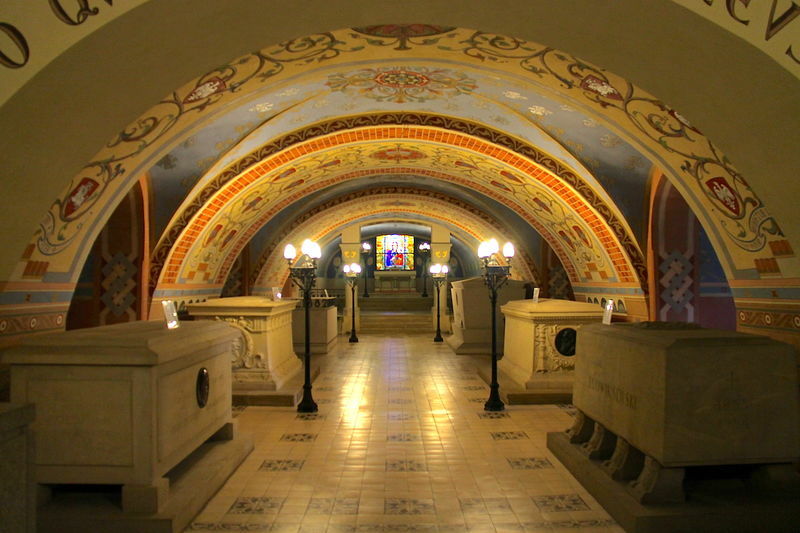 The crypt was then turned into the burial site of the honourable figures in Polish history. Soon, many other poets, artists, activists and advocates of Polish independence were buried in Skalka, including Jozef Ignacy Kraszewski, Stanislaw Wyspianski, Karol Szymanowski, Czeslaw Milosz. Pauline Church on the Rock is an active place of worship. Masses on weekdays: 7.00, 8.00, 16.00, 19.00; masses on Sundays and public holidays: 7.00, 8.00, 9.00, 10.30, 12.30, 17.30, 20.00. The complex is open for visitors every day.